Last summer I went back to China. I still remember how excited I was. I had all the beautiful images in my head: hanging out with friends, being drunk at night and singing songs to get home, talking to friends about funny things, doing what we used to do, and going to travel someplace new together. I finally arrived at the airport in China in the afternoon. “Already four years,” I said to myself. I called a taxi to get home. On the way home, I watched the scenery roll by the cab window. It hadn't changed a lot, and I could still remember what was there. Finally home, I stepped in front of my house, and a similar feeling flooded back into my mind: warmth and happiness. I took out the key, and opened the door, the smell of home never changed through time. The clock was still working, “Da...Da...Da,” echoed through the empty house. I put down the luggage, and couldn't wait to see the changes around my house. An old neighbor saw me, and he said, “Hey, you are coming back, long time no see,” and I smiled, “Yeah, no time no see.” Then the conversation was over. Maybe just because we had long time no see, and both of us didn’t know what to say to each other. I kept walking around. 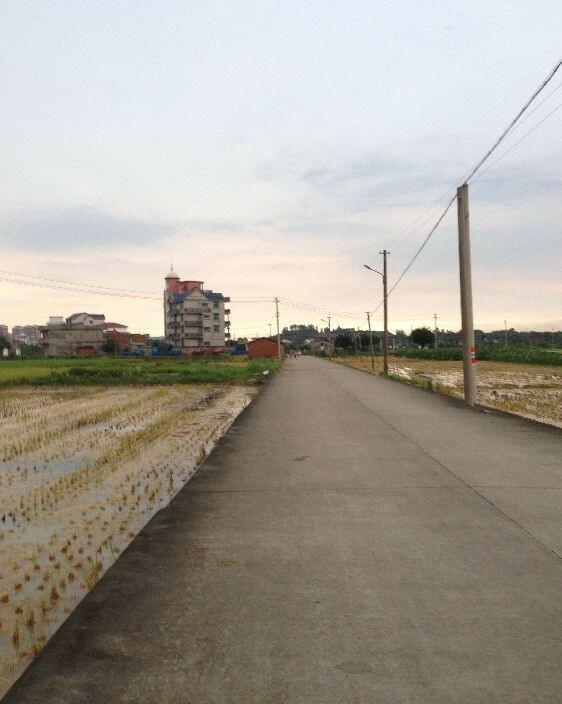 The paddy fields occupied my eyes, and memories like a fountain, poured into my brain, and started to play. Summer. A group of barefoot kids shuttling among the paddy fields chase and catch frogs. Mud on their faces, clothes, bodies, hands and feet; they are so happy. But when they get home, “Hum, where were you going? You think I don’t know where you were? Were you going to catch frogs again? Hum? I told you: Do not to go to the field, it’s dirty! Why you don’t listen to me? No dinner for you tonight!” All moms are pretty angry, because they have to spend time cleaning up the mess. After a half hour, “Go eat!” This is moms. On summer nights, there are so many stars hanging in the sky, big and bright. Ten to fifteen kids play around on the empty ground. “Let’s play hide and seek!” one yells out. Then they run away to hide. They have a lots fun during the game, and every time their moms shout: “Come home! It’s late!” Their faces just like the alarm clock ringing when the kids are dreaming something good. In late summer, there is a harvest. Farmers are busy working the paddy fields. After that, a huge empty field appears. Kids are running on the wet and soft field freely, chasing the wind, like fish swimming in the water. At night, big kids, like twelve years old light a fire in the center of the field. “Let’s roast tomatoes!” They are all really happy to hear that, because roasted tomatoes have a really good taste. They are all excited, and the big kids start to give out assignments to the others. “You, go to find some dry branches.” “You, go to find some dry leaves!” “You, go to find some tomatoes!” and so on. After a while, all the stuff is ready. It’s roast tomato time. “Fire!” The big kids use matches to make the dry leaves into flames. After a few seconds, a big fire lights up all of the kids’ happy faces. They sit around the bonfire and toss the tomatoes in. They are talking, smiling and playing. A half an hour, the fire becomes weak, and the tomatoes are ready for eating. “Hot, hot, hot!” Everybody gets one tomato and eats, satisfaction growing on their faces. It’s a busy summer. Night soon falls, the sunset still beautiful as a picture. I am home, have turned on the light, and sit on the coach. One of my friends called me: “Hey, how are you doing, Dingyi?” He was one of the kids who played hide and seek with me in childhood, and one of my best friends. “Not bad, are you coming back to the village?” I said. I got him. I knew he was too busy, and it took time to get home, like eight hours, and he didn’t want to give up the job. “Alright, I am waiting for you anytime!” I said. Then we talked about recent life, and the conversation was over. After I hung up the phone, I felt so tired. The kind of tired I had never experienced. I switched off the light. It was so quiet; I seemed to hear my heart beating. I felt a kind of lonely, like the whole world gave up on me. I thought they would be home waiting for me, and we would talk about our childhood together, and drink at night singing songs to get home, but all the images and all the expectations were destroyed in one second. They all have their own lives now, and we can’t go back to childhood anymore, but kept going. Still, the moon. Still, the stars. Still, this house, still, but different in time and mood. As I get older, I tend to be more and more nostalgic. I know I can’t go back, but can only keep going, treasuring today in tomorrow.